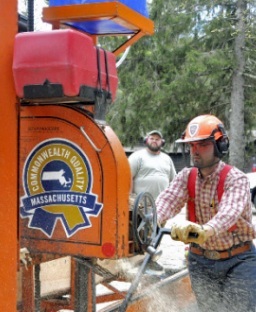 Sean Mahoney, the Department of Conservation and Recreation’s outreach service forester, will bring DCR’s portable sawmill to Walden Pond State Reservation to help keep lumber local. Trees that have been cut at Walden will be re-used in the construction of the new visitor center. Come see how it’s done in this public demonstration! Meet in front of the Thoreau House Replica near the Main Parking Lot. Please wear proper walking shoes and bring your water and sunscreen. Children must be accompanied by an adult. This entry was posted on August 29, 2015 at 9:50 am and is filed under 9_15 Public Programs. You can follow any responses to this entry through the RSS 2.0 feed. Both comments and pings are currently closed.